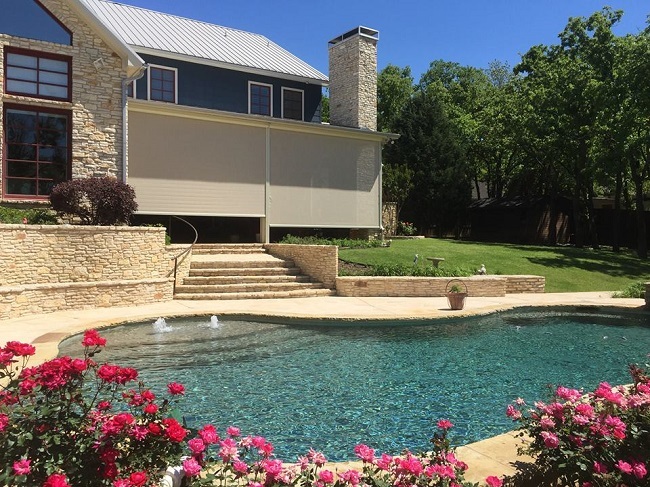 Keep Your Patio Comfortable This Winter: 3 Reasons to Add Roll Away Shades - Longhorn - Screens. Shades. Shutters. Patios aren’t just for enjoying a balmy summer evening. Keep your patio comfortable all year with a dependable set of roll away shades. Here are three ways they can help keep your deck comfortable. 1. Don’t let winter sun glare force you inside. The winter sun hugs close to the southern horizon, even in the early afternoon. This new angle creates a lot of glare and stops your patio roof from being as effective. But roll away shades can drop down to keep that glare at bay without making your patio feel too small or ruining the view. Roll away shades diffuse the light so you still have plenty of natural light. Look for models that you can program on a timer or have a solar sensor so you don’t have to reset the shades throughout the seasons. 2. Keep your space heated. It can start to dip below freezing even in the late fall. If you’re not a fan of cold temperatures, that can make going outside uncomfortable even while the sun still shining. A space heater can only warm a small portion of an unprotected deck, especially if there’s a breeze. But roll away shades create enough of a barrier to help keep that heat contained. Even though roll away shades are made with a mesh fabric full of holes that allow for good air flow, it can still keep the majority of your space heater’s output center in your patio so you don’t have to stay huddled near the vents. 3. The shields can deflect snowfall. Texas doesn’t get many blizzards, but it does get an occasional slushy snowfall that has a mix of snowflakes and rain. Your roll away shades can keep the flurry off of your patio, even if it suddenly starts falling. While your shade can’t deflect a heavy snowstorm, they can give you enough cover to get back inside or even to stay on your patio and watch a light snowfall. Go to Longhorn Solar Screens to see which shades are the best fit for your property and home.